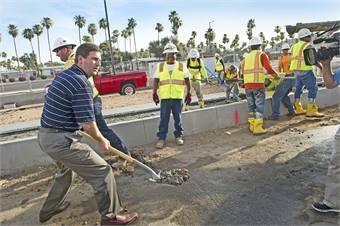 Phoenix Mayor Greg Stanton assists with placement of the first track on Valley Metro's Northwest Light Rail Extension. PHOENIX — With hopes of tripling light rail’s mileage over the next 30 years to continue to serve important, often overlooked demographics, such as people with disabilities, students and working families, Phoenix Mayor Greg Stanton announced the formation of a citizen’s transportation advisory committee, reported the Downtown Devil. Citizens can participate either by attending meetings in person that are held regularly across the city or by submitting comments online at talktransportation.org, a new site the city is launching to reach more people and collect a greater diversity of opinions. The committee will be led by former U.S. Secretary of Transportation and former director of the Arizona Department of Transportation Mary Peters. For the full story, click here.